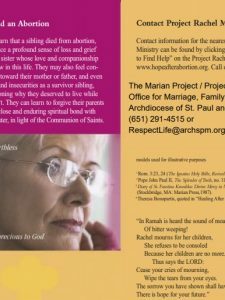 Project Rachel is the Catholic Church’s outreach for confidential ministry for anyone who desires healing after an abortion. This includes mothers and fathers of children lost to abortion, grandparents and other relatives, health care providers, and many others. Abortion crosses all boundaries of race, age and socio-economic position. Project Rachel’s mission is to provide confidential and compassionate referral services and awareness. 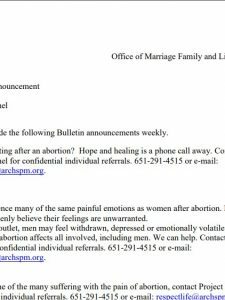 Resources are available for spiritual, emotional, and psychological healing to anyone who has been impacted by abortion.